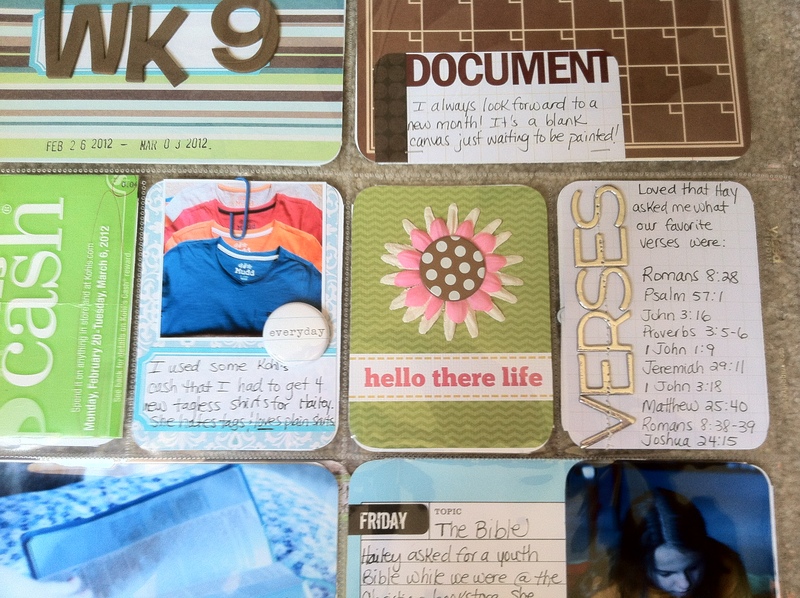 Project Life: Week 9 | I am JuJu! I can’t believe I’m sharing week 9 of project life. This year is just flying by & I’m so glad that I have all 9 weeks documented. I went back and flipped through my album this week and I loved how seeing the little details just transported me back to the week I was looking at. I love that project life does that! I am still loving documenting our lives this way. I only wish I had started using project life years ago. I have definitely found my rhythm to putting my layouts together each week. I usually print off my photos Saturday night or Sunday depending on how my weekend goes. I don’t work on my layouts through the week, I just jump right in on Sunday. Often times I work on it for a bit and if I get stuck I just walk away and come back later. I try to have my pages done by Sunday night or Monday morning so that I can photograph them Monday with good light. I like to have my post totally done on Monday so that all I have to do Tuesday morning is link up with The Mom Creative and One Happy Mama. I have found that this is what works for me. I think that is key! So onto this weeks layouts. As always, below is a look at the entire layout, including the insert. I had 2 shorter blog posts this week that I wanted to include. I used these 6×12 journal templates by Ali Edwards to include this post that recounted a conversation with my girls in the car this week on the front & this funny story about Skylar on the back. I LOVE including my blog posts in my project life. Below is a picture of the entire layout without the insert. I didn’t have as many pictures this week as Hailey was home sick the whole latter part of the week. I do love how I was able to include more journaling and some other thoughts I had. Hailey asked for a new youth Bible this week and read it constantly. I loved that I was able to capture this moment and share with her how proud I am of her that she is reading her Bible every day. I included the Kohl’s cash that I used to get Hailey several new t-shirts. Clothes shopping for her is never easy as she has a lot of sensory issues. I was thrilled that I was able to find cute, modest t-shirts that were tagless. The “hello there life” and the “remember this” journal cards are from the same set that I used last week by Kristina & Crystal. I really love this set of cards & look forward to using them more. I haven’t stitched on my pages the last several weeks, but this week I stitched quite a bit and I was really happy to be using my machine again. I just like the extra touch it adds to my pages. Here are a couple close-ups. And a close-up of the right side. I used one of these journal sheets from Marta Writes that my sister gave me. She uses these in her pages all the time & she gave me a journal of them when I was at her house a few weeks ago. I love the simple writing prompt that captures the moment. If you want more project life inspiration make sure you head over to The Mom Creative and One Happy Mama and see all the wonderful layouts people are creating! This entry was tagged project life week 9. Bookmark the permalink. Thanks Kelli! I always enjoy the challenge of adding more words & thoughts! Thanks for stopping by! So glad you were able to pick up some new things Conni! Thanks for stopping by & for your encouragement! Great use of paperclips. Fun pages. Thank you Andrea! I love using office supplies! 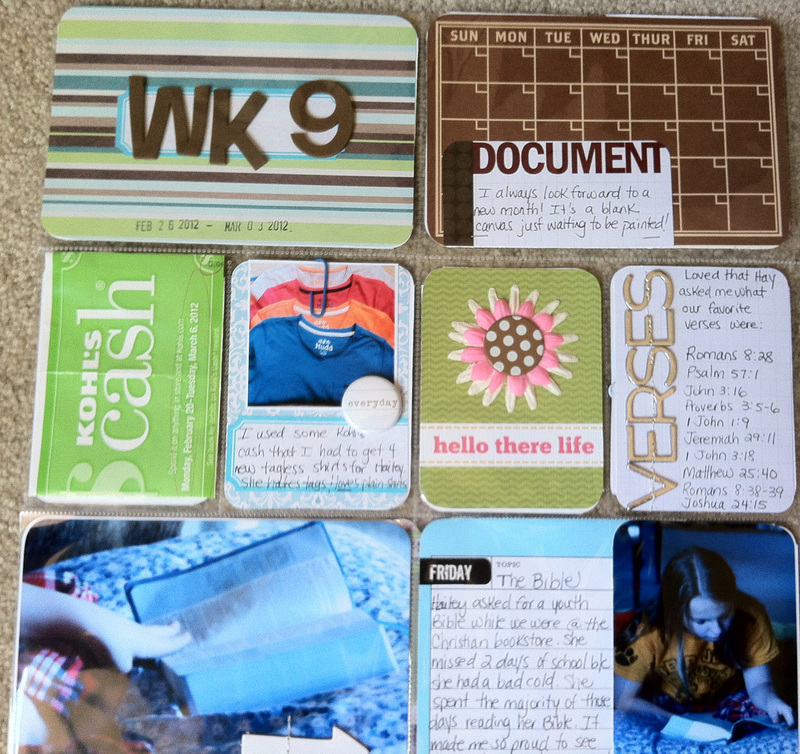 Hi there!..I love the journaling card and martha stewart lables…I had my week 9 all done except for one spot and kept staring at it..didn;t have a pic for it and was stumped…love the idea you used wiht the labels…hope you odn;t mind if i do something similar? Great idea!..Love your pages..they look great! I absolutely LOVE the MS labels…I use them just about every week. I’d love to see what you do with them! Thanks for stopping by! hia! love it all, as usual! Thank you so much! I’m loving this way of documenting! Ok, I think I’m going to have to buy that card set from Kristina & Crystal – so lovely! My fave part of your layout this week is the photo of Hailey with her Bible. Thanks Jules! I love that picture of Hailey too…makes my heart happy! You will be totally happy with the set by Kristina & Crystal…I love it! hi Julie, what a great week you have captured, love all the colour, and the cards from kristina are awesome, really love what your’ve done, l have just finished reading another book, it is called the messengers by Nick Bunick, have you ever seen it or heard about it, was wondering what your thoughts on it were ? l thought it was great and has brought me closer to god, but would like another believers point of veiw. Thank you Kate! I haven’t read The Messengers, but I’ll put it on my list. I’m currently reading a healthy eating book. I will let you know when I read it. Also, love the “Today” journaling- Nice! Thanks Lisa! 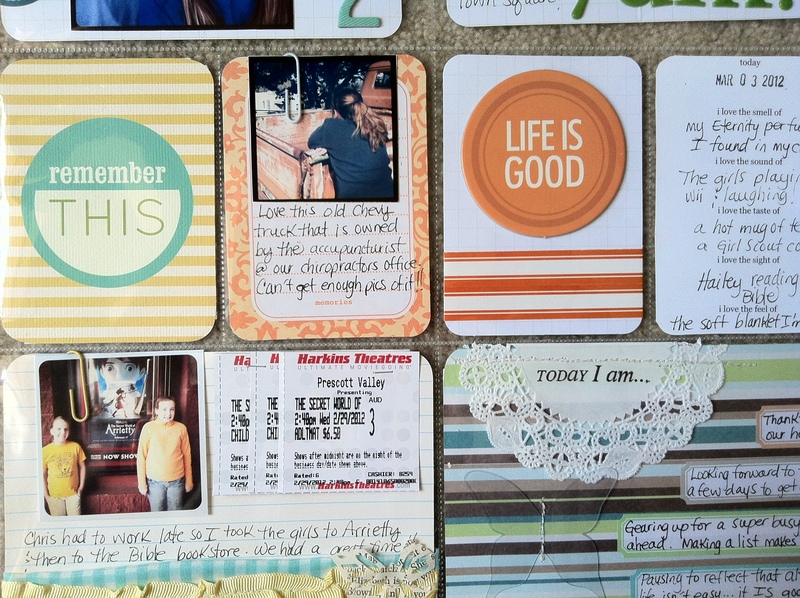 I love the Today journaling cards as well. I can see myself using those quite often! This layout is so soft this week! Love the flowers and the Hello Life card…very pretty! Its so nice that you have a routine for getting your layouts done…I still haven’t found mine yet. That is my goal for this week! Thanks Jenn! I really felt like this week everything came together. Keep going, you’ll find that rhythm. Thanks so much for your encouraging words! I want to second this! I think it’s awesome that you’ve found your groove to PL. Another week of great pages! It really is very mellow and calming. Love it! I love your pages Julie – the colours look fantastic and I love how you’ve concentrated on the journalling. Thank you! I love the challenge of adding more journaling as I usually find that I add so much more about our every day lives. Thanks for stopping by! Great week Julie, love the overall look. Thanks Sharon! I enjoyed putting together this week’s layout. Our burgers were super good & the fact that they were more on the healthy side made us feel a bit better! Have a great week! I completely agree…where has the time gone?! And I, too, wish I would’ve started this years ago. I’m hoping to start this with my kids as they go through school. I’m guessing they would enjoy it later on in life. Beautiful layouts by the way! That is exactly my weekend routine too! Some Sundays my daughter will work with me and make cards for her friends. Your layouts are so elegant and lovely. And I love doilies too! That looks great! I especially love the “today I am” card. 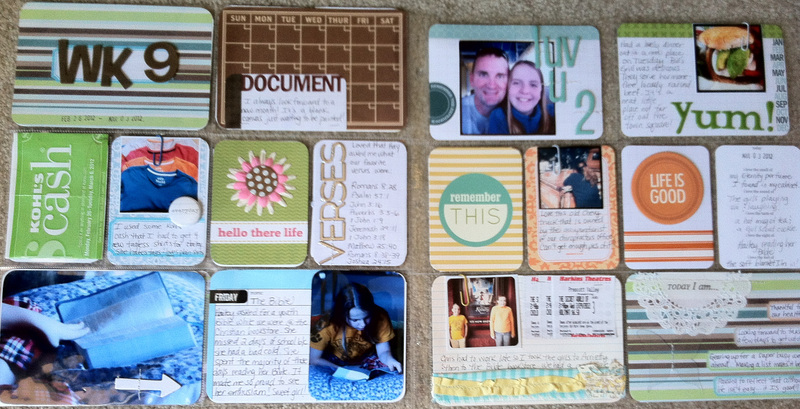 I fell in love with Project Life because you can individualize it and make it your own. It’s perfect for me, who just wants to stick some pictures in and do a bit of journaling, but it’s also great for the more dedicated scrapbooker! Will be checking out your blog in the future to see your progress! It is so nice to see another mom who looks for modest clothes for her girls. With 3 girls I know that is hard and a challenge. I love your idea of putting your blog posts in. You do a great job!!! Thanks for sharing! Really love your style! The calendar is so cute and love the little instagram photos! 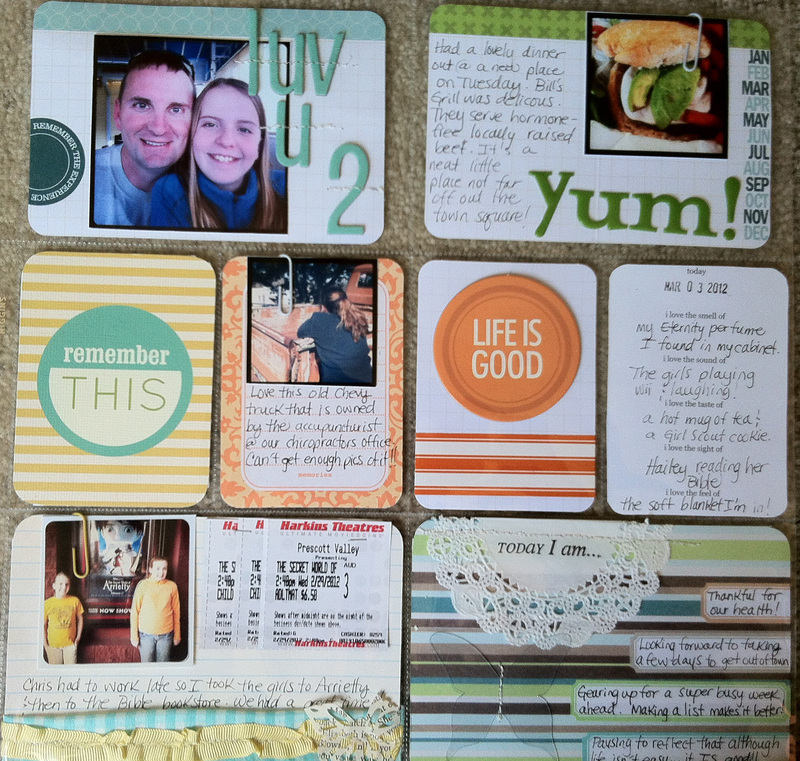 Love how you incorporated those journal prompts from Marta! I wish that I had started using it years ago, too. I’ve thought about going back, to redo albums that are falling apart (so sad!) but maybe when I am all caught up – past and present. Love your use of the instagram photos and your little touches. Fabulous week! Love all the different thickers and stickers on here, so colorful! Don’t they add great texture in person? Thanks so much Leena! Hope all is well with your family! Love your pages! You used our cards beautifully! Thank you for the sweet words about them! Love the calendar and great photos, too! Enjoyed them so much! Hugs! Thanks Kristina! I’ve so enjoyed using your cards. Thanks for stopping by!